In the 1960s, as demand for rail travel fell, Penn Station fell into disrepair and critics argued that its eight acre footprint would be better used for other purposes. As a result, from 1963 to 1968, the original structure was razed and Madison Square Garden and Penn Plaza were built above it. 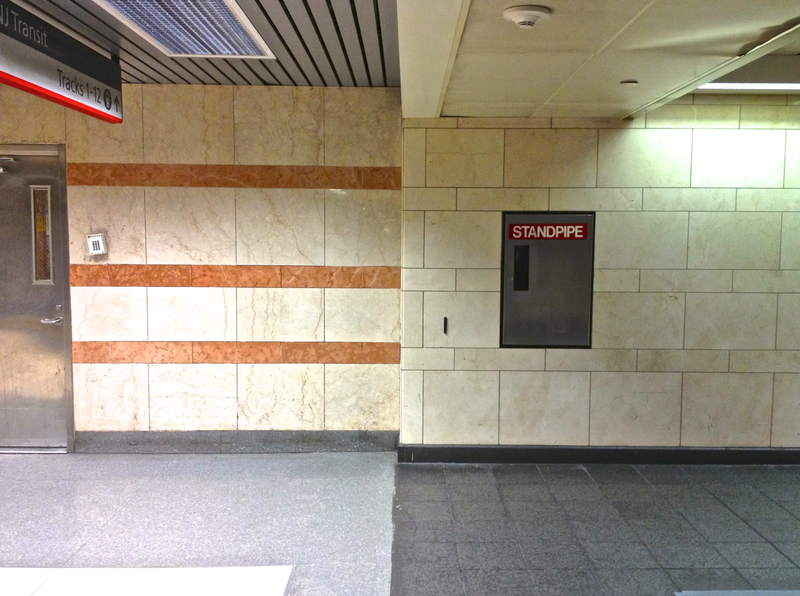 Penn Station was now relegated to the basement levels of the complex. 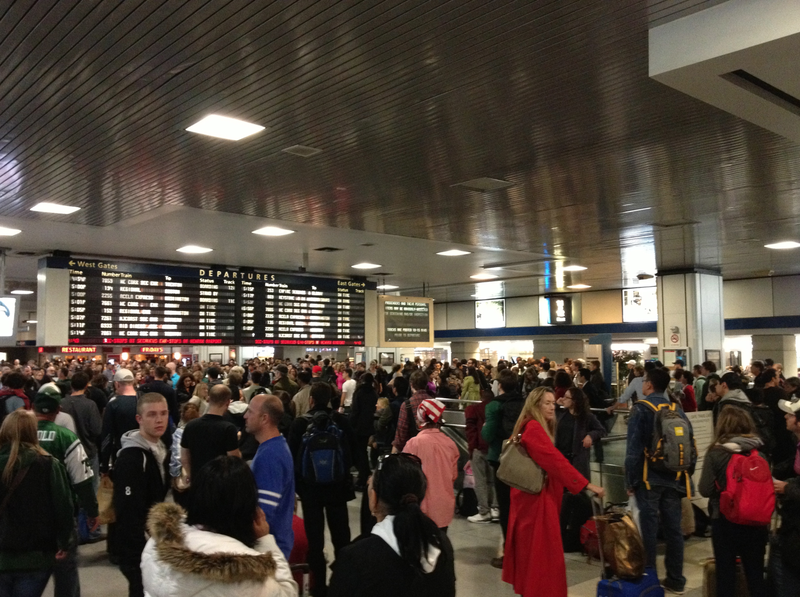 At the same time, Penn Station, which used to exclusively serve the Pennsylvania Railroad, was sectioned off for three different rail operators: Amtrak, NJ Transit, and LIRR. 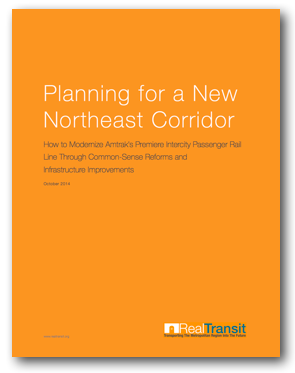 This division was initially accomplished by eliminating the unified, central concourses in the original Penn Station structure. 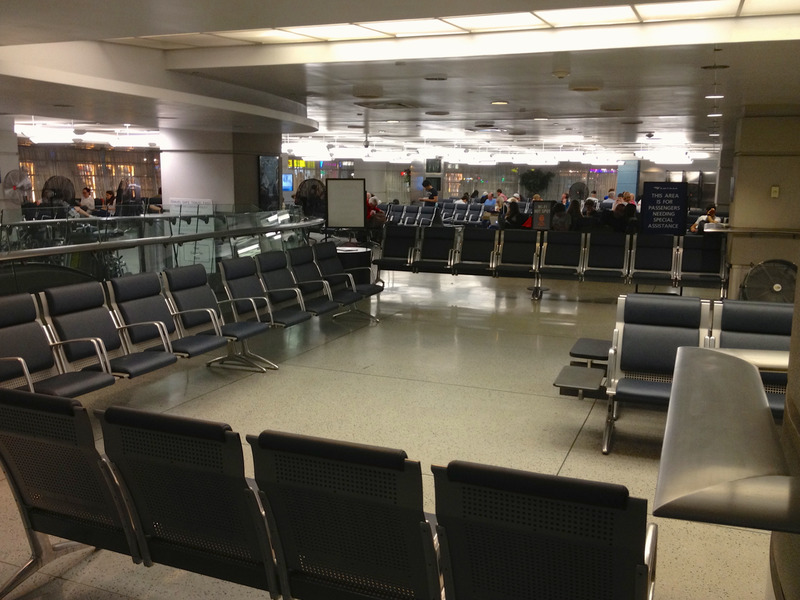 However, as ridership on the three systems grew, Penn Station slowly added new entrances, waiting areas, and space to supplement existing concourses. In 1986, the MTA built out space west of Eighth Avenue for the LIRR West End Concourse. 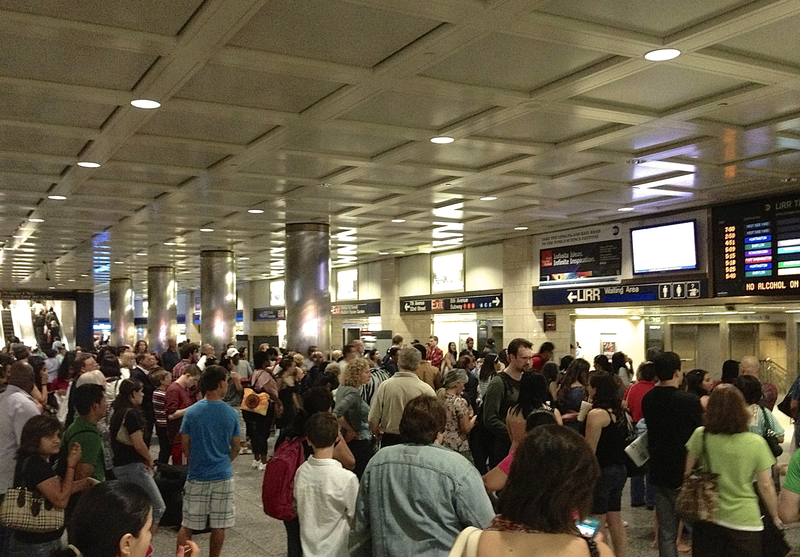 More recently, NJ Transit constructed its own concourse in 2002. 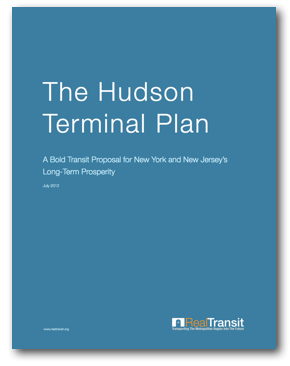 Unfortunately, this disjointed approach to expanding the busiest transit hub in North America has not helped to alleviate the constant overcrowding and delays for which Penn Station is infamous. And today, concourse space and track resources are divided disproportionately to each transit network’s use of the station. 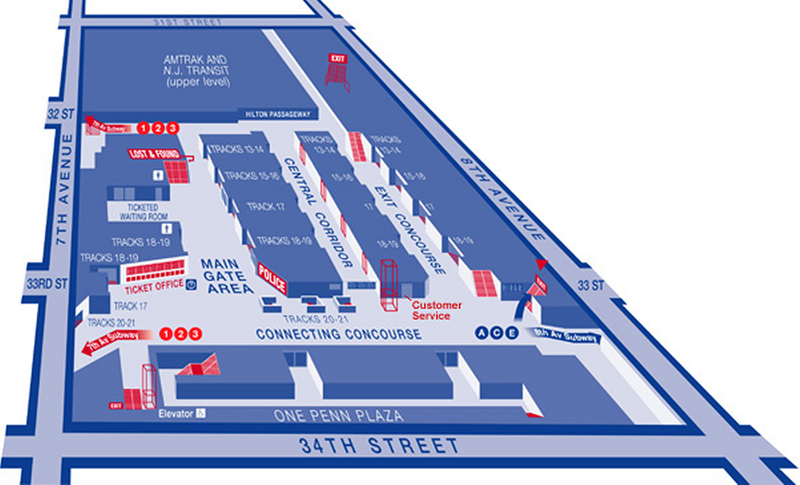 The diagram below demonstrates how Penn Station is divided into three independent stations within the larger Penn Station complex. With three separate train systems splitting the original Penn Station footprint, space is tighter now than it was when Penn Station opened in 1910. Instead of utilizing a unified central concourse for all trains, today, each section of the station is maintained and styled differently by its respective operator. As shown by the track diagram above, Tracks 1-4 are used exclusively by NJ Transit and Tracks 5-12 are shared by Amtrak and NJ Transit trains. LIRR has the exclusive use of Tracks 17-21 on the north side of the station and shares Tracks 13-16 with Amtrak. Except for the shared platforms, a passenger cannot reach the LIRR tracks directly from the Amtrak and NJ Transit concourses. 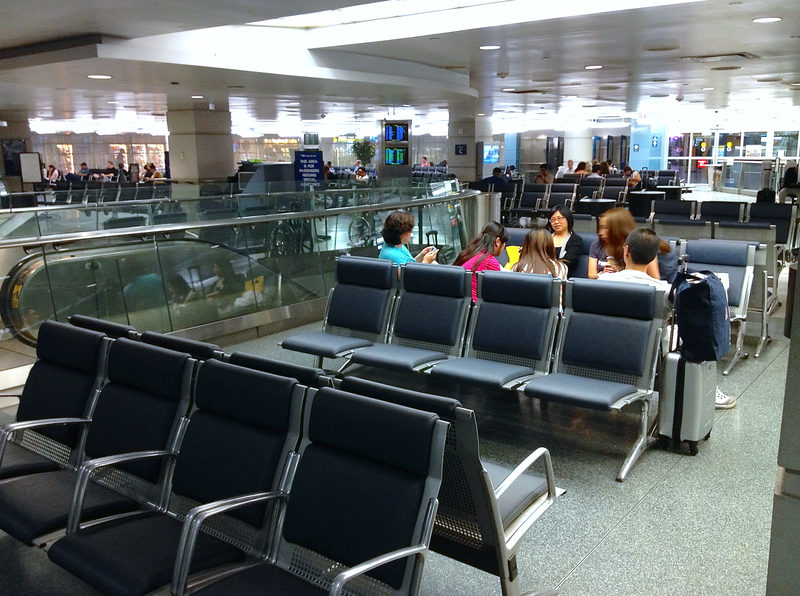 Since Amtrak and NJ Transit share tracks, passengers from a NJ Transit train can wind up in the Amtrak concourse, and vice versa. This division of space has resulted in drastically smaller concourses, fewer seating areas, and more difficult navigability throughout the station. The absurdity of having three independently run train stations operating within a larger transit hub is most easily seen by simply walking around Penn Station. During rush hours, commuters pack into the two small NJ Transit and LIRR “concourses,” waiting for track assignments to appear. There are no seats and space is extremely tight. Meanwhile, directly across from NJ Transit’s train board, rows of empty seats, partitioned off from commuters, await the mere 3% of total Penn Station passengers that ride Amtrak during peak hours. Both seating and floorspace is abundant. Directional signs appear in different fonts and designs depending on where you are within the station complex. Concourse maps and diagrams in one part of Penn Station may not even include a diagram of the other concourses. In response to the problems associated with overcrowding and delay in Penn Station, Amtrak’s Gateway Project proposes building a sub-basement annex beneath Penn Station to house additional trackage and concourse space. 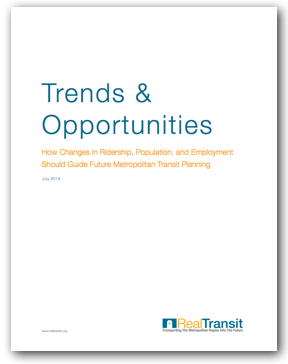 However, considering the challenges already facing Penn Station as a result of having three independently operated stations within the larger complex, it may be time to look outside of the box and build an entirely new transit hub as opposed to adding a fourth station to Penn Station.